The Dentistry Department at the Montreal Children’s Hospital (MCH) receives 22,000 patient visits per year, making it the busiest of its kind in Canada. The clinic trains residents in pediatric dentistry, and its specialties: orthodontics, endodontics, prosthodontics, periodontics, oral and maxilla-facial surgery. Although some patients receive routine checkups in the general clinic, many other patients need specialized care. “Most of our visits and emergencies are linked to dental decay but we see all patients from 0 to 17 years of age with an emphasis on trauma, syndromic patients and patients with special needs. There are hundreds of syndromes, but we see many osteogenesis imperfecta patients and cleft and cranio-facial patients or medically compromised children,” says Dr. Annie Marleau, Chief of Pediatric Dentistry at the MCH. In addition to operating his own clinic, Dr. Jean Rizkallah, former resident in the department, returned to the MCH in May 2015, by joining the orthodontic clinic. He focuses primarily on children and adolescents with special needs, who are more likely to present with an imperfect positioning of their teeth which can affect their development both physically and socially. 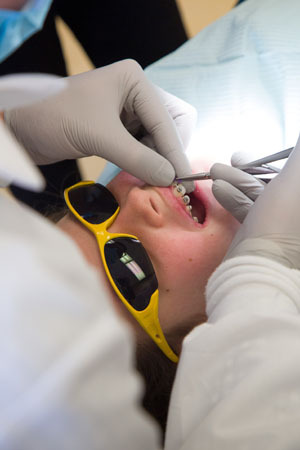 Often times, children and adolescents with special needs are more anxious about dental procedures, have a low tolerance for dental treatments or are unable to communicate dental pain, all of which can make orthodontic care more difficult, lengthy and costly. The specialized care necessary to treat special needs patients is not readily available in the average private orthodontic clinic. 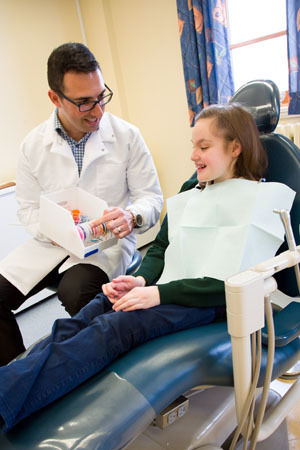 “Providing orthodontic care to patients with special needs requires an adapted approach, experienced staff, and a flexible schedule since treatments can often take more time. This is the kind of care we offer at the MCH,” says Dr. Rizkallah. Katrina Cannavino is 11 years old and has been a patient in the MCH dentistry department for seven years. “She’s a brave patient who has come a long way,” says Dr. Marleau who cares for Katrina’s general dental needs and eventually referred her to Dr. Rizkallah’s care. Katrina has autism spectrum disorder and had many fears about going to the dentist, but after several appointments, she became familiar with the procedures and the staff and developed a level of comfort with the whole process. Michelle Prince, Katrina’s mom, explains that her daughter was frightened by the thought of receiving orthodontic treatment, in part because of “Darla,” an antagonistic character in Disney’s Finding Nemo who dons a head-gear and has a tense visit to her uncle’s dental clinic. “For Katrina, everything that is unknown to her is especially difficult,” says Michelle. However, after she discussed it with Katrina and gave her a chance to think about it, Katrina agreed to meet with Dr. Rizkallah. “The people at the clinic really know how to put Katrina at ease,” says Michelle. “I stay behind in the waiting room while she gets her procedures done and all I hear coming out of there is laughter.” Last March, Katrina had a palate expander placed in her mouth, and now has braces to further correct her teeth. The MCH Orthodontic Clinic works with a growing number of patients and now has three physicians, including Drs. Marie-Claude Chouinard and Adriano Farina, seeing patients. In fact, the clinic’s success has led to a six-month waiting list. Dr. Rizkallah has always enjoyed the work culture and environment at the MCH Dentistry Department. The orthodontics clinic allows him to work with patients that present him with new challenges and force him to think outside the box. “We are providing healthy smiles to children who otherwise might not have been able to get proper treatment. It’s a gratifying experience,” he says.